[Mac version] The Reset View button (or double-clicking in the movie) will now also reposition and resize the 2nd channel PiP window to the top left corner of the main window. [Mac version] Default map type is now MAPQUEST since Google changed something with their Maps service that prevents Dashcam Viewer from rendering any graphic elements onto the map (no placemarks, routes, etc.). 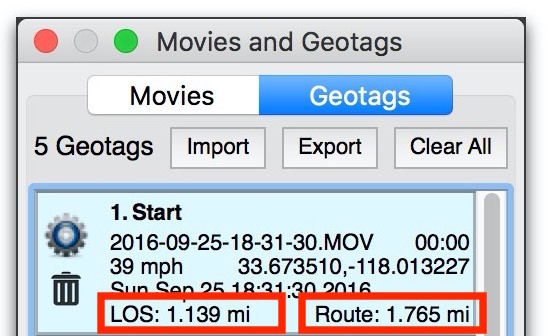 Added “real-time” Line-Of-Sight (LOS) and Route distance computations to the Geotags list items. This LOS distance provides current LOS distance between the geotag point and the current vehicle location (including altitude differences if altitude data is available). The Route computation displays the distance along the route between the geotag position and the current vehicle location. The LOS and Route metrics show the “real-time” distance to the vehicle from the geotag point. Fixed bug that would ignore clicks in the Altitude plot.